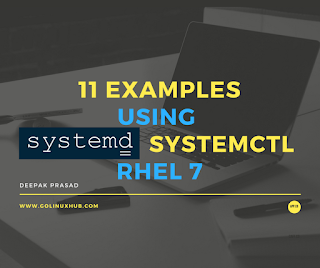 Just to brief you out before I start with the examples start RHEL 7 now the services are named as something.service such as firewalld.service, and are stored in /lib/systemd/system, /usr/lib/systemd/system/ and /etc/systemd/system directories. A unit configuration file encodes information about a service, a socket, a device, a mount point, an automount point, a swap file or partition, a start-up target, a watched file system path, a timer controlled and supervised by systemd. For example to check the service status of "nfs-server.service"
Dec 25 19:19:55 golinuxhub.lab systemd: Started NFS server and services. 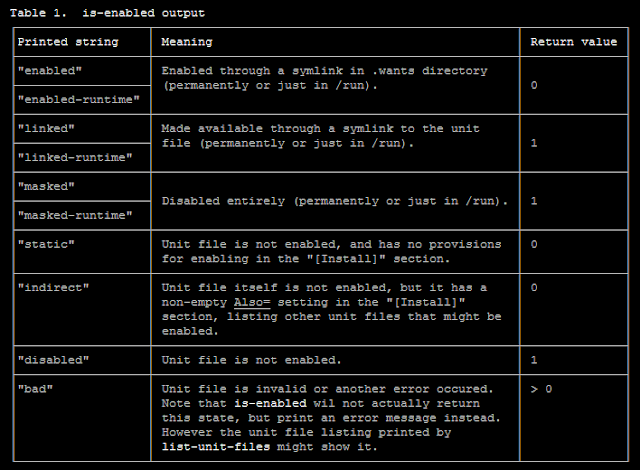 also print the current unit state to standard output. print the current unit state to standard output. For example to start nfs-server.service"
For example to stop "nfs-server.service"
Dec 25 19:26:28 golinuxhub.lab systemd: Stopped NFS server and services. By default we use "restart" flag to restart a service but with RHEL 7 we have a new flag i.e. try-restart, with this the systemd will check if the existing state of the service is in running state then only it will attempt to restart the service but if the existing state of the service is in stopped state then systemd will skip restarting the service. 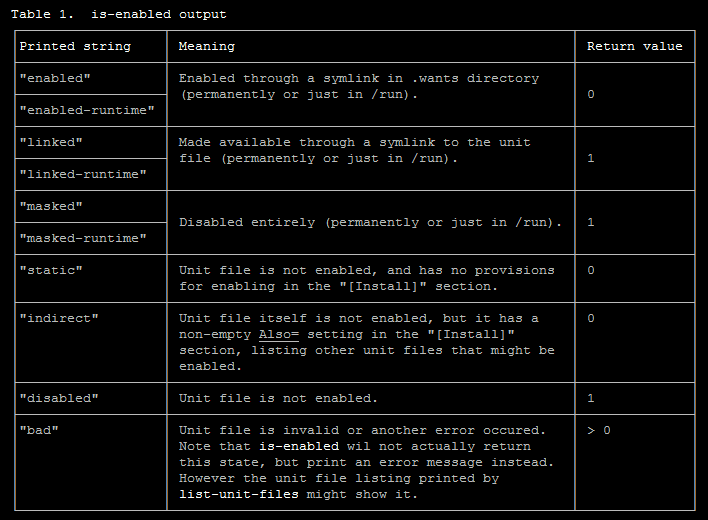 condrestart is equivalent to this command. Dec 25 19:41:49 golinuxhub.lab systemd: Started NFS server and services. Dec 25 20:13:13 golinuxhub.lab systemd: Started NFS server and services. Dec 25 20:14:14 golinuxhub.lab systemd: Stopped NFS server and services. Dec 25 20:16:03 golinuxhub.lab systemd: Started NFS server and services. Dec 25 19:19:54 golinuxhub.lab sshd: Server listening on 0.0.0.0 port 22. Dec 25 19:19:54 golinuxhub.lab sshd: Server listening on :: port 22. Dec 25 19:19:54 golinuxhub.lab systemd: Started OpenSSH server daemon. Dec 25 20:18:53 golinuxhub.lab sshd: Received SIGHUP; restarting. Dec 25 20:18:53 golinuxhub.lab systemd: Reloaded OpenSSH server daemon. Dec 25 20:18:53 golinuxhub.lab sshd: Server listening on 0.0.0.0 port 22. Dec 25 20:18:53 golinuxhub.lab sshd: Server listening on :: port 22.
and lets attempt a "reload-or-restart"
Dec 25 20:19:07 golinuxhub.lab sshd: Received SIGHUP; restarting. Dec 25 20:19:07 golinuxhub.lab systemd: Reloaded OpenSSH server daemon. Dec 25 20:19:07 golinuxhub.lab sshd: Server listening on 0.0.0.0 port 22. Dec 25 20:19:07 golinuxhub.lab sshd: Server listening on :: port 22. 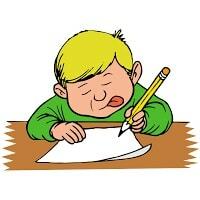 Dec 25 20:19:35 golinuxhub.lab sshd: Received SIGHUP; restarting. Dec 25 20:19:35 golinuxhub.lab systemd: Reloaded OpenSSH server daemon. Dec 25 20:19:35 golinuxhub.lab sshd: Server listening on 0.0.0.0 port 22. Dec 25 20:19:35 golinuxhub.lab sshd: Server listening on :: port 22.
force-reload is equivalent to this command. Here by enabling or disabling a service we mean to make sure the service is enabled to be started after a reboot of the system, similarly if disabled the service should not start automatically on boot. 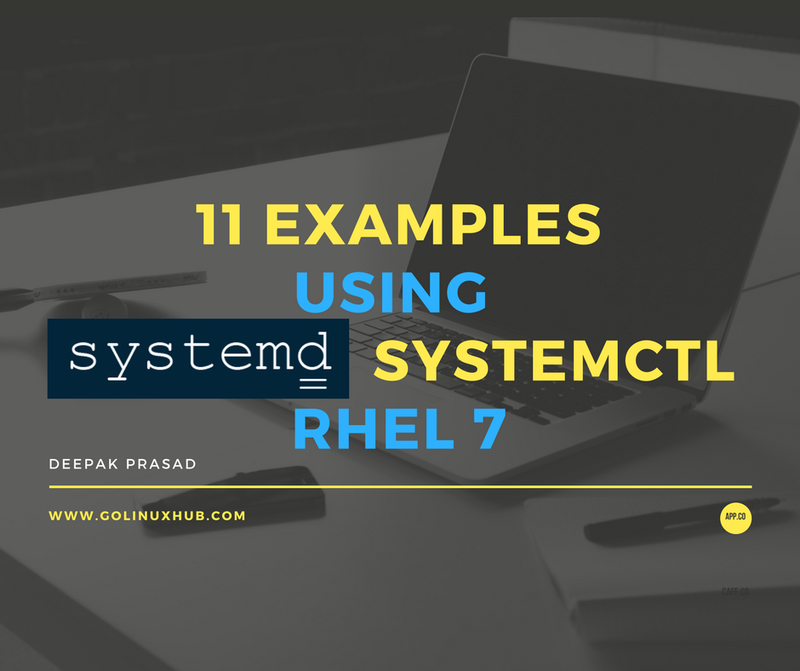 When we enable a service it creates a symlink of the unit file of the service from "/etc/systemd/system/<default_target>.wants/<unit_file.service>" to "/usr/lib/systemd/system/<unit_file.service>"
Similarly when disabled it will remove the symlink from the default target. For example to enable "nfs-server.service"
NOTE: You might get a blank output if the service was already in disabled state. For example to disable "nfs-server.service"
As said above if your service is already in enabled state and you attempt to re-enable it then the output will be blank. Any of the dependency service needed by the main service to start must be "active and running" or else the main service will fail to start. Assuming here I stop rpc-statd.service which is needed for "nfs-server.service"
Dec 25 19:19:54 golinuxhub.lab systemd: Started NFS status monitor for NFSv2/3 locking..
Dec 25 19:40:55 golinuxhub.lab systemd: Stopped NFS status monitor for NFSv2/3 locking..
Now since one of the dependent service is dead lets check the status of our "nfs-server.service", so as expected the service has gone dead. Dec 25 19:41:19 golinuxhub.lab systemd: Started NFS status monitor for NFSv2/3 locking..
To see what services and other units (service, mount, path, socket, and so on) are associated with a particular target and are configured as dependencies for the specified target. The list shows the list of services and unit files which are dependency for this target and to boot up to this target level these list of services and unit files will be called. Use "--show" flag to view the property of a unit file as shown below.